This megalithic henge and stone circle in the Orkneys in the far north of Scotland is the third largest in Britain. 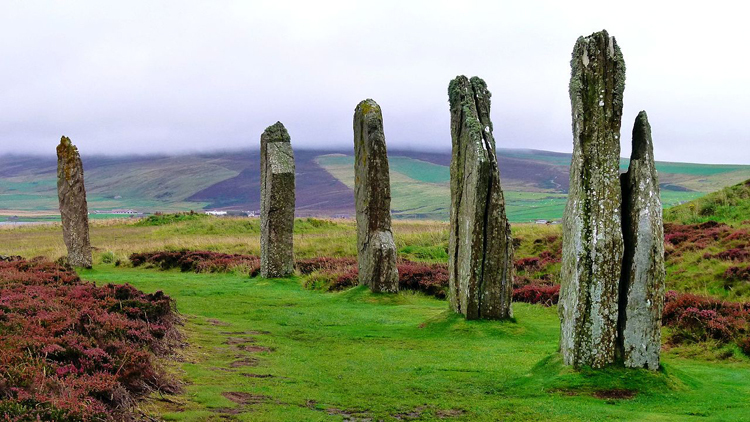 Six miles north east of Stromness it is now part of the UNESCO World Heritage Site (The Heart of Neolithic Orkney) yet its dating remains uncertain, estimated at 2,500-2000BC, but still resisting scientific certainty. Excavations in 2008 still await comprehensive publication. There are 27 stones still standing from the original 60 and Brodgar is almost certainly part of a larger ritual landscape approximately three miles long including the mound of Maes Howe. Within two square miles there are a further two circle henges, four chambered tombs, standing stones, mounds and cairns. So plenty of activity for such a remote landscape. Most of the stones of Brodgar are about 7 feet tall while one impressive sentinel stone is 15 feet tall. Location: Signposted on the A965 on Orkney mainland between Stromness and Finstown.